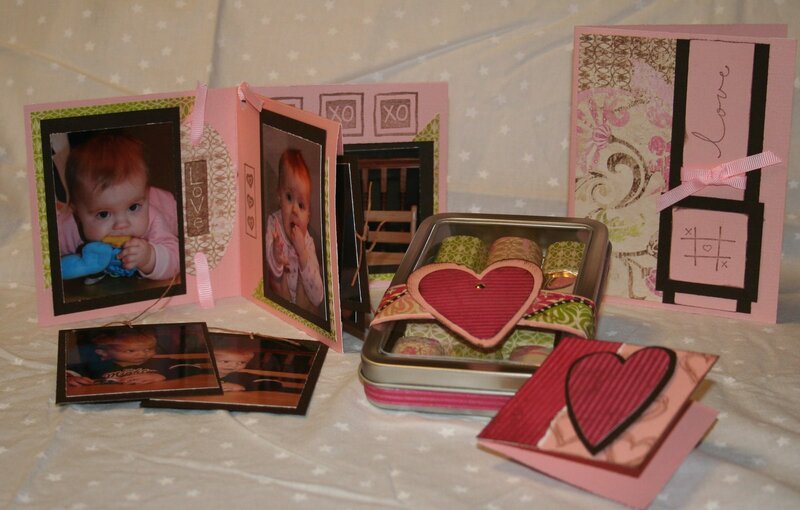 My last post was a Valentine's Card made from the Angel Company's Mimi Paper and Love Doodles stamp set. I have expanded on that and now have a few more items using the same paper and stamps. The Nugget Tin is a favorite of mine - but then it has chocolate in it so naturally it is a favorite!! The mini album is made from a single sheet of cardstock and is then embellished with Mimi paper and stamps and tags. The mini album has a front and back cover, 4 inside pages to scrap, and a pocket to store extra photos. My niece and nephew are the stars of the album!! I also made a cute little 3x3 gift card to round off the collection. Hmmm... wonder what I'll add in the future? -A January thaw that has lasted through the weekend. -The purring of my cat as I scratch her under the chin. -The new found space after doing a deep clean in my craft room - now if it would only stay that way! -The renewed sense of hope as we begin a new year.